Zoe Smith won gold at the 2014 Glasgow Commonwealths, four years after claiming bronze at the Delhi Games. 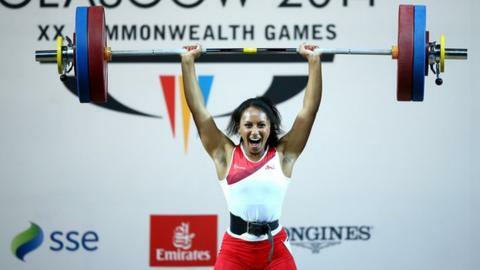 Commonwealth champion Zoe Smith will lead an eight-strong GB Weightlifting team into the 2015 World Championships. Owing to injuries and illness, the event in Houston, USA, 20-28 November will be Smith's first major international since Glasgow 2014. "My focus, first and foremost will be on giving my all and improving my personal bests," she said. Combined results from the 2014 and 2015 Worlds will secure the top 24 nations places at the Rio 2016 Olympics. However, with GB only fielding two athletes at last year's event it is unlikely that the British team will be able to attain that rank. Therefore the 2016 European Championships in Førde, Norway, are likely to be the crucial qualifier. The British women's team of Smith, Emily Godley, Sarah Davies, Rebekah Tiler and Mercy Brown are able to compete in the USA with the backing of UK Sport support. The unfunded GB men - Gareth Evans, Jack Oliver and Sonny Webster - are relying on private sponsorship to fund their participation. "My preparation has been going well and I'm happy with how I've been lifting in training and competition this year," said Britain's youngest ever senior champion Tiler. British Weight Lifting Performance Director Tommy Yule added; "The competition provides an exceptional opportunity for our athletes to amass greater experience of competing on the international stage in advance of next year's Olympic Games."